Hello. My name is Steven Philipps-Harries and I am the Deputy Training Safety Officer (DTSO) at Castlemartin Training Area in Pembrokeshire. 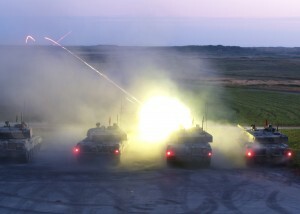 I am one of a six man team who ensure that the Training Area meets the needs of defence. Between us we arrange for any unit training at Castlemartin to be accommodated and fed and make sure that all training is conducted safely. We are supported by Landmarc Support Services who provide the facilities to support the delivery of military training. 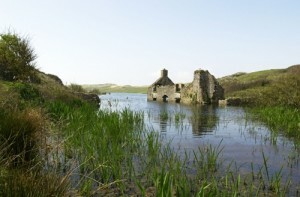 Castlemartin consists of approximately 6,500 acres of land on the west coast of Pembrokeshire. It was acquired for military training in 1938 for use as a Tank Range. Over the years it has been developed so that it can support all firing, including Mounted Close Combat and Dismounted Close Combat, firing anything from Cadet air rifles to Fighter Ground Attack aircraft. Within the Castlemartin Training Area are a number of ranges which can be allocated separately to different units. 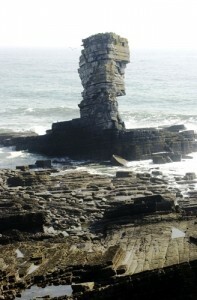 1952 saw Castlemartin incorporated into Pembrokeshire Coast National Park (PCNP) and part of the Pembrokeshire Coast Path runs through the Range to the east of Stack Rocks. The path is closed when live firing is taken place and a diversion path runs to the North of the Range Danger Area (RDA). Castlemartin was classified as a Site of Special Scientific Interest (SSSI) in 2011 and a new path known as the Castlemartin Range Trail was built which links to the Pembrokeshire Coast Path. The construction of the path was a joint effort between the Bumblebee Conservation Trust, Pembrokeshire Coast National Park, Natural Resources Wales, National Trust, Landmarc and MoD that links to the Pembrokeshire Coast Path. No day working here is the same. My role is a varied one and often challenging - I am the main link between the military and external stakeholders. 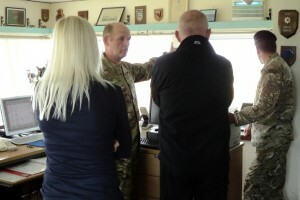 I allocate ranges within Castlemartin so that a unit carrying out its training can meet their training objectives. This often means having up to eight ranges running concurrently with different units all at different stages of their training. Once the ranges have been allocated I put what is known as a RDA template onto the computer in Range Control. This gives the area of where the bullets will be landing and what areas we need to keep clear of personnel and shipping. Range Control has two radio systems to assist with this, one to talk to the Ranges and staff and a maritime radio to talk to shipping. To assist in ensuring that the Sea Danger Area (SDA) is kept clear, I liaise with SMIT International who provide two safety craft, sea conditions dependent. These are located on the eastern and western side of the Training Area and try to intercept or talk to any sailors who may enter the SDA. In the winter it’s not too hard to keep clear but come the summer we can have anything up to 50 boats which we guide around the edge of the SDA. Another vital role I carry out to ensure that the Training Area conforms to the Site of Special Scientific Interest protocols is liaison with the tenant farmers and graziers. We have five permanent tenant farmers who graze the land and cut silage for winter feed. Four of them also have grazing rights on the communal grazing areas of the Training Area which they share with the shepherds. Sheep graze all of Castlemartin apart from the land which is specifically tenanted. To ensure that there are no injuries to sheep from live firing practices there are a number of fenced off areas to hold sheep when live firing is taking place, something I discuss with the two head shepherds. This grazing regime is vital to ensure that the grassland management plan conforms to the SSSI management plan. The SSSI management is a vital part of ensuring that we abide by the protocol set out by Natural Resources Wales. I represent the Training Area at the Nature Component Planning Group which meets twice a year and is attended by representatives of Conservation groups. We draw up plans for how the SSSI will be managed and what surveys are being carried out to monitor the unique features that make Castlemartin a SSSI. I also chair the Pembrokeshire Ranges Conservation Group which is made up of conservationists, archaeologists, geologists and the National Park. Finally, and just as important, I produce Castlemartin content for the Ministry of Defence website, local newspapers and Milford Haven Port Authority website. These inform civilians who live, work and play alongside the Training Area what the firing times are for the month and any road or footpath closures that effected by firing. I also produce paperwork to inform the local in-shore fishermen what areas of the coast are affected by firing. Castlemartin has moved with the times and I tweet every day on the DIO Twitter account to inform followers of what is happening on the Training Area. This includes training, conservation matters and recreational access. You can follow us at @mod_dio on Twitter or by searching Twitter for the hashtag #modcastlemartin. So as you can see I have a very busy but interesting job which I thoroughly enjoy due to its variety. I hope you have learned something about Castlemartin Training Area and the importance of its role in supporting UK military capability. If it’s stoked your interest, we have a Range Viewing Area in Warren which is open to the public to come along and watch training – hope to see you there! I regularly sail in and around the Haven and a number of sources like the MCA, Marina, Range Office etc will give firing dates in advance, but I can never find advance information regarding the seaward range limits. The recorded message from Castlemartin gives this information but only on the morning of the firing, sometimes too late to catch the 3 knot/6 hourly tidal flow along the coast, so planning a trip in a vessel with a speed of 5-6 knots without knowing the distance to sail is a waste of time. I read in your article that you produce information for local fishermen regarding inshore access. Is this freely available as it must include the range limits I am requesting? If it needs to be purchased I could take it up with Milford Marina as many visitors in the summer sail into the danger area unawares (up to 50 according to your article) and could be forwarned when they book up, saving the Smit safety boats some mileage. (btw - I checked your Twitter pages and it's all land based, nothing about inshore range limits). Please reply if you have further information. Hi Andy. Many thanks for your comment. We will liaise with our colleagues at Castlemartin and get back to you ASAP. I've heard back from the team at Castlemartin. They accept the need for this information to be provided and are looking to add it to the Castlemartin Firing Times page (https://www.gov.uk/government/publications/castlemartin-firing-notice--2) in the next couple of months, so hopefully it shouldn't be a problem for much longer. Many thanks for getting in touch and I hope this is helpful.